In Narendra Modi’s BJP, who has the right over front-row chairs: leaders from Gujarat, his janmabhoomi, or those from Uttar Pradesh, which sent him to the Lok Sabha? BJP youth wing leaders from the two states sought to settle this question last weekend, shoving and pushing each other out of the front rows at a party convention. The war cries of “UP, UP, UP” and “Gujarat, Gujarat, Gujarat” rent the air. BJP general secretary Ram Lal threatened to take their pictures, identify and sack them. The gladiators from Gujarat and UP dispersed as a drone started flying overhead. This happened at the two-day convention of the Bharatiya Janata Yuva Morcha (BJYM), the BJP’s youth wing, at the Parade Ground in Hyderabad. The much-hyped event was expected to launch the party’s poll campaign in Telangana and prepare the ground for further forays into the south. BJP president Amit Shah, a dozen union ministers and chief ministers, and prominent party functionaries delivered fiery speeches over two days, mostly targeting Congress president Rahul Gandhi. The common man in Hyderabad and elsewhere in Telangana seemed unmindful of it. With five MLAs in 119-member Telangana assembly, the BJP is not reckoned as a force in the state. It was no surprise that all that the political class and the local media seemed to remember about the BJP event was the Gujarat-versus-UP rivalry over front-row seats. Yet, the Telangana assembly election should keep the BJP interested. The saffron party may not have much at stake in the state but the poll results may hold out lessons for the BJP and many other parties. That’s because chief minister K. Chandrasekhar Rao seems to have modelled much of his style of governance and politics on Modi’s: personality cult, centralised power system, servile ministers, lawmakers and partymen, pro-business image, emphasis on welfare schemes and doles, and a premium on (or projection of) probity in public life. And both engage in a one-way communication with their colleagues, be it party office-bearers, legislators or ministers. There are glaring differences between the two, too. Modi is a superior orator. KCR is also known not to entertain his legislators much. But, he is not ruthless when it comes to giving them tickets even if it may mean risking his bid for another term in office. Unlike Modi, here in Telengana, KCR’s family – son, daughter and nephew –plays an active role in politics and administration. But it’s the striking similarities between the two that have earned KCR the moniker, ‘Telangana’s Modi’, from a section of his party colleagues. KCR government is known to be clean and taint-free. To send across a message to his ministers and the bureaucracy, the chief minister had dropped his deputy, T. Rajaiah, in 2015, and given “punishment postings” to some senior officials following complaints against them, say those close to KCR. There are whispers in the corridors of power about the undue clout of two companies – an infrastructure giant and another involved in real estate. The chief minister, however, enjoys a na-khaaoonga-na-khaane-doonga image. Modi government tom-toms GDP growth figures and so does the Telangana Rashtra Samithi (TRS) government in Telangana. TRS MP K. Keshava Rao says the state achieved a 17.7 per cent growth during the KCR regime. At the BJP’s convention in Hyderabad, Amit Shah gave out numbers to the party’s young leaders to disseminate – 30 crore bank accounts, 5.5 crore Ujjwala scheme beneficiaries, 7.5 crore toilets, 13 crore vaccinated, 14 crore Mudra loans, et al. The BJP president asked them to get in touch with 22 crore families of central scheme beneficiaries. Keshava Rao, who is tasked with the preparation of the party manifesto, also reels out the data on beneficiaries—totalling well over a crore – of the state government’s welfare schemes. The TRS has prepared a list of these beneficiaries but lacks the BJP’s well-oiled machinery at the grassroots to establish contact with them and canvass. Both KCR and Modi claim credit for providing riots-free administration. Both are facing tough questions on the job front and are confronted with the challenge of meeting the high expectations of the people, though for different reasons. 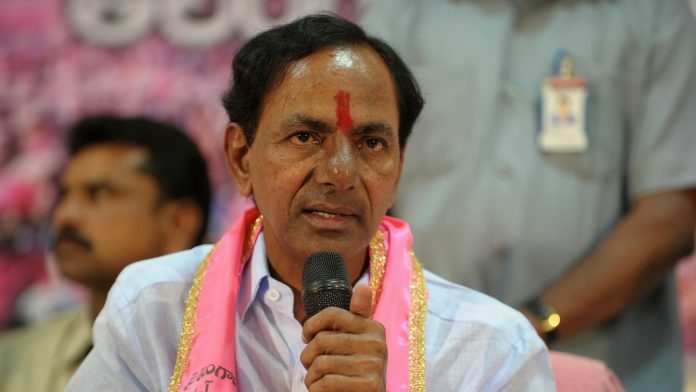 Like Modi, KCR is the TRS’ unique selling point, or USP. Like the Prime Minister, the chief minister has no serious challenger on the horizon from the opposition camp. Just as the opposition parties are exploring the option of state-specific alliances to beat Modi-led BJP in next year’s general elections; the Congress, the Communist Party of India (CPI), the Telugu Desam Party (TDP), and the Telangana Jana Samithi (TJS) have come together in Telangana to beat the TRS in 7 December polls. Therefore, when our political class and poll pundits sit down on 11 December to decipher the results and assess what it means for the 2019 general election, they shouldn’t lose sight of Telangana. It might offer a different perspective on the electoral implications of Modi model of politics and governance. KCR is inexperienced chief minister , he is outspoken but under performer. If anyone asked to name one chief minister who hardly comes to Secretariat, it should be Telangana CM. Altogether, he has very slim chances to come back to power in Telangana.